Believed to be a reservation piece. No defects but the leather is a little stiff. Beautiful piece. $650. 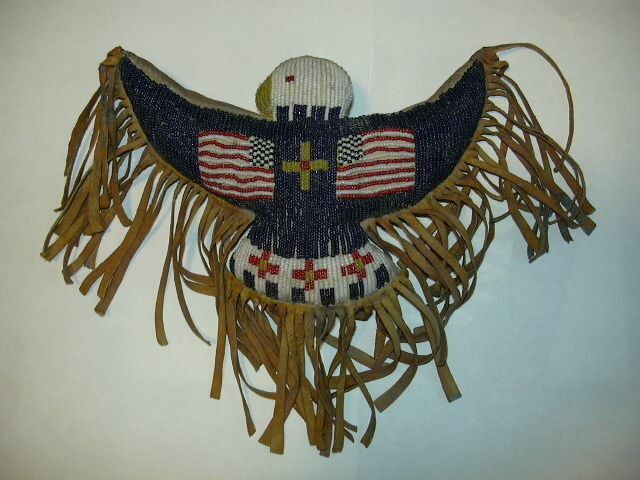 Native American Items for sale: Your links to all my sales - Jewelry, Baskets, Pottery, Knives, Moccasins, Prints, and more! Beaded Fetishes Home Page: Start your tour of my beaded fetishes here! Unique depositories for a baby's umbilical cord and a sacred totem. Beaded Horse with horse hair mane: A real treat. I own three of these beauties: 1 creme, 1 white, and 1 black.